Click to see an index of the men whose names are on the memorial. This links to details of each man. This page, and all pages in the section on Granton War Memorial, has been researched and written by Jessie Denholm. Where others have helped with information, this has been acknowledged on the pages concerned. The Granton War Memorial nowadays stands in the grounds of Granton Parish Church on Boswall Parkway. The church was not built until 1934 and the memorial originally stood outside the earlier church at the foot of Granton Road. It is not, however, a memorial to men who attended or had some connection with Granton Parish Church. It is rather a memorial to ‘men belonging to the Parish of Granton who fell in the Great War 1914-1919’. When someone was said to ‘belong’ to a particular place, this normally meant that they had been born and/or brought up in that place. Many of the men named on the Granton War Memorial fall into this category. The word ‘belonging’ seems, however, to have been given a much wider and more flexible meaning by those who compiled the list of names for the memorial. It includes men whose only known connection with Granton was that they worked there. There were some whose families had only recently come to live in the Granton area. In one instance the Granton connection appears to have been through marriage. 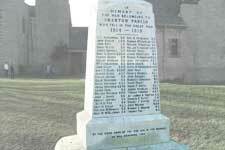 They were all men whom the community of Granton wished to see remembered on their Parish War Memorial. The Parish of Granton was a relatively new parish established by the Church of Scotland in 1899. It covered an area stretching from the west side of Wardie Road to West Pilton. The southern boundary was on Ferry Road and the northern was the sea. Much of this area was open country. 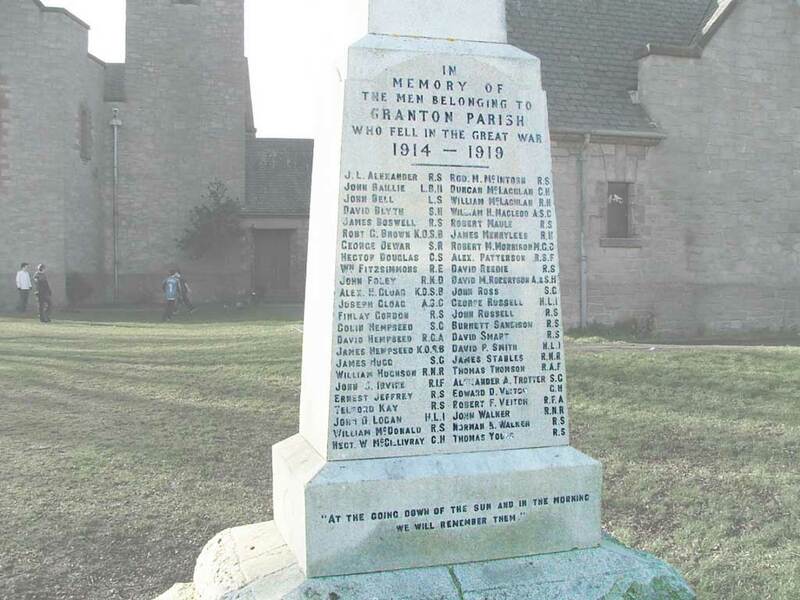 The casualties named on the war memorial tended to come from Granton Road (and surrounding streets) and Lower Granton Road with a minority coming from the farms and cottages spread over the remainder of the parish. On Lower Granton Road, Numbers 1-38 were in Newhaven Parish. The Granton War Memorial does include some men who lived in this area and who must have in some sense ‘belonged’ to Granton. There were others in this part of Lower Granton Road whose names came up in the course of research who are not on the Granton Memorial. The original aim of those who set up war memorials after the First World War was that those who had died should be remembered. As over ninety years have passed since then, memories of the men who died have faded and it is difficult to remember them when we do not know who they were. The aim of this project has been to produce some biographical material on each of the men concerned. Besides contributing to the remembrance of these men, this was considered to be a worthwhile local history project in the sense that it tells us something about the lives of a randomly selected group of families living in Granton at the beginning of the twentieth century. What this project lacks is information from the families of these men. It would be wonderful if we could locate people to whom memories and perhaps even letters and photographs have been passed down and could incorporate such material into the stories of the men named on the Granton War Memorial. If you can help with this aspect, please contact me . The link below will take you to an index page showing the men whose names are on the memorial with their date of death, rank and number, and regiment. The index page gives links to the biographies of each man (only some are available at present). Follow the link below to see the sources of the material on these pages and where you can find out more.